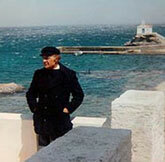 On November 2 and 3, there will be an event of original music by George Kouroupos under the title Odysseus Elytis’ This Small, this Great World!, with poetry and prose set to music, representing the main facets of the work of Odysseus Elytis: lyricism, a restless spirit of inquiry, courage, spirituality, sensation and true emotions. The B&M Theocharakis Foundation for the Fine Arts and Music holds an exhibition titled The world of Odysseas Elytis: Poetry and Painting from September 22 to November 27. The exhibition presents for the first time all of Elytis paintings together with manuscripts and editions belonging to the poet’s private collection, as well as published and unpublished photographs. The Hellenic Foundation for Culture organizes a series of events in honour of the poet in its several branches and Centers. The tribute, which opened at Odessa and Belgrade in October, continues in Berlin, Sofia, Bucharest, Tirana and Alexandria during November, and will be concluded in Trieste in December.